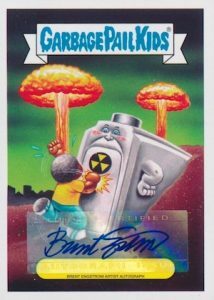 While GPK has covered many topics over the years, 2017 Topps Garbage Pail Kids Series 1 Adam-Geddon prepares collectors for the end of the world, Garbage Pail-style. The offbeat sticker product can be found in basic Hobby and Hobby Collector boxes. Touching on classic end-of-the-world scenarios like zombies, aliens, and giant monsters, more practical fears are covered as well, with floods, meteor strikes, drone attacks, and even the plague. The 90-card sticker set includes both A and B names along with new artwork for a total of 180 cards. Parallels largely go the gross route with Puke (1 per Retail/Hobby pack only), Bruised (1 per Hobby Collector pack), Spit (#/99 - Hobby Collector only), Bloody Nose (#/75 - Hobby Collector only), and Fool's Gold (#/50). 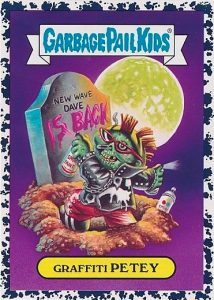 Although not really about the hits as much, collectors have a few options in 2017 Topps Garbage Pail Kids Series 1 Adam-Geddon. The choices include Artist Autographs, Patch Cards (Hobby Collector) and Printing Plates. Featuring hand-drawn artwork, artist renditions include base Sketch Cards (Retail/Hobby) along with Hobby Collector-exclusive Shaped Sketch and Double Artist Panoramic Sketch Cards. 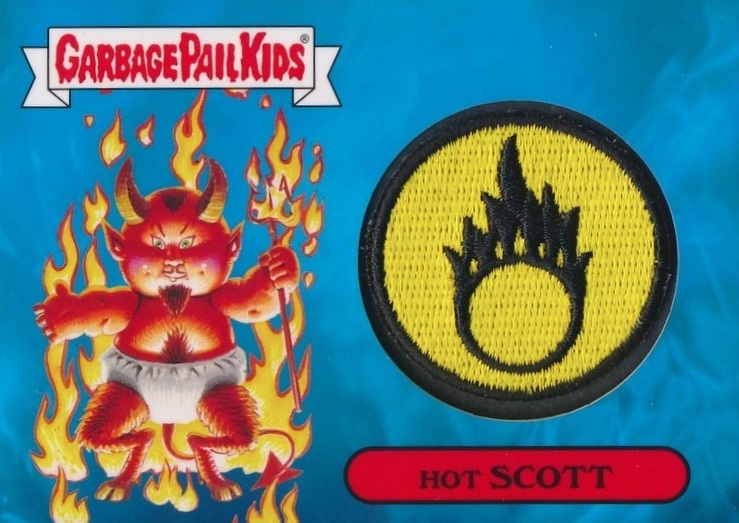 Another option, 2017 Topps Garbage Pail Kids Series 1 Adam-Geddon revisits notable 2016 GPK political stickers with Best of the 2016 U.S. Presidential Election. Only found in Hobby Collector packs, these inserts showcase new character names. 180 cards, including 90 A and B names. Shop for complete sets on eBay. PARALLEL CARDS: Puke (1 per Retail/Hobby Display Box Pack), Bruised (1 per Hobby Collector Pack), Spit #/99 (Hobby Collector), Bloody Nose #/75 (Hobby Collector), Fools Gold #/50, Printing Plates 1/1. 14a of 18 NUCLEAR WYNN T.R. 5a of 18 BOMBS AWAY T.J. 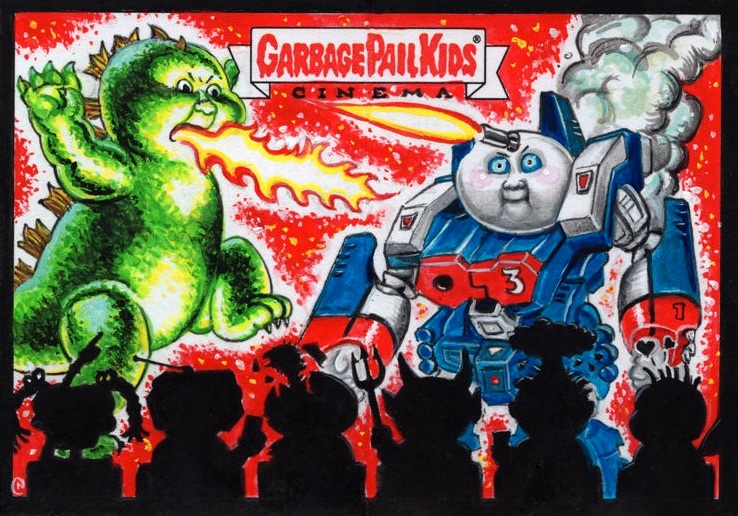 Please email me a checklist for Garbage Pail Kids 2017 Series 1 Adam-geddon. Thanks! I just opened 2 entire cases of the 2017 Garbage Pail Kids and there is NOT 220 Cards. Only 190. So, I pulled an Adamgeddon Gold Border Tom Bunkered today. It was labeled #1/50. Would his up its value? I’m new to collecting cards, so this was super exciting! I believe it just enhanced my addiction.